The SportsStuff Bandwagon allows your riders to jump off of their regular donut-shaped tubes and into a new world of inventive towables. The Bandwagon allows from one to four riders to sit in all different styles, facing all different directions. Riders may sit forward, backwards, sit, kneel, lay, squat and otherwise improvise to create the best ride of the day. The backing is made with recumbent mesh, and the seating and laying areas are covered in EVA foam floor pads for extra comfort during long afternoons of water sports. Riders will enjoy foam seat bumpers and comfortable handles with effective grips. A patented aluminum Quick Connect towing system allows the tube to be easily attached and detached from the boat. The nose is shaped to prevent the unwanted nosedive that happens when riders lean forward during takeoff. 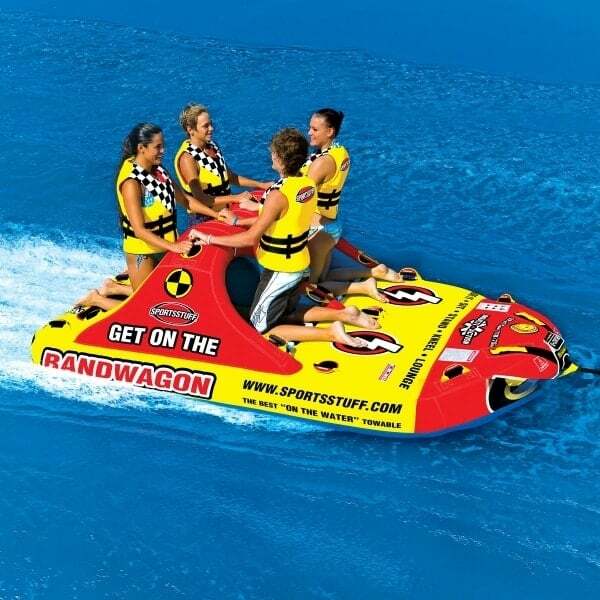 Never capsize again with the SportsStuff Bandwagon 2 + 2!